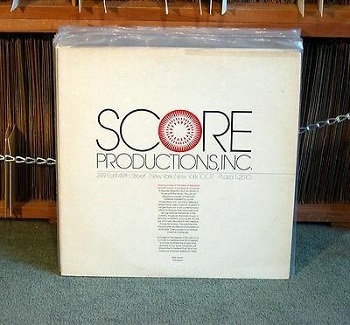 Most of the music within the show was provided by Score Productions, a musical production company specializing in background music and themes that was started in 1963 by music producer Robert A. Israel, who composed the show's third theme. Like many soap operas at the time, Another World was originally produced with live accompanying organ music. Organ music was used primarily at the beginning and end of scenes, including customized motifs for the female characters and couples. Irna Phillips wanted Charles Paul (with whom she had worked on As The World Turns and had commissioned to write the show's opening theme) to be the show's organist. But as soaps were still taped live, Paul wouldn't have been able to make it back from the NBC studios (where AW aired at 3:00) to the CBS studios to play for The Secret Storm (which aired at 4:00) in time. Instead, Clarke Morgan was hired as organist, from May 4, 1964 to December 28, 1968. However, Clarke's music was used until January 7, 1969 during Sam Lucas and Lahoma Vane's wedding. After his death, Chet Kingsbury and Al Finelli took turns at the keyboard, until Kingsbury was selected and remained until 1973. Another World creator, Irna Phillips had this to say in her manuscript, "All My Worlds," about the use of organ music on soap operas. "I suppose now is as good a time as any to admit that I alone am responsible for introducing in radio serials something that has come to annoy me and has annoyed many listeners and viewers -- organ music as a background. I know for a certainty that organ music is the one element most people immediately associate with the serial. Why did I turn to the organ for background music? The Guiding Light was the first program to use this music, and the explanation, in this instance, is logical. Mary, the daughter of Doctor Rutledge, was the organist in his church. Often during scenes in the minister's study, Mary could be heard practicing. It soon became obvious to me that organ music did much to help set the mood for a scene. That must have been obvious to other serial writers and sponsor, for within a short time many programs were punctuated by organ music. I rue the day I ever turned to the organ." The Original Opening Theme Song ran from 1964-1966 with the Original Opening Sequence. The introduction began with chords played on a Hammond organ. Then three piano notes were played, followed by an ascending, arpeggio and chromatic melody line as the organ chords swelled to an intense and exciting close. The introduction was dropped in 1966 and only featured the main melody during the opening sequence. The Second Theme ran from 1966-1974 and was written by Charles Paul. The theme was a sweeping, beautiful composition with lush instrumentation and sweeping melody featuring the organ, and a full orchestra and celeste solo during the mid-section. The celeste gave the piece a lovely, tranquil quality befitting moments of joy, declarations of love, and wedding ceremonies. The Third Theme ran from January 1975 - September 4, 1981. This theme was written by Bob Israel and may in fact have premiered during Another World's hour long transition on January 6, 1975. The composition featured a full orchestra with a gorgeous melody played three times. The third includes the piano with a slight variation of the main melody and chord progressions. These two theme songs were used during the opening sequence of Interlocking Rings. The Fourth Theme song debuted with the Block Letters opening sequence and played from September 7, 1981 - March 27, 1987. The theme music was written by composer Jonathan L. Segal. This piece was majestic and included a catchy main melody. The introduction featured brass instruments, then led to the primary melody being played by strings and then the trumpets. The mid-section prominently featured trumpets and french horns with harmonies played by the other wind instruments. This composition also features the main melody being played three times before its closing chords. On March 27, 1987, Crystal Gayle and Gary Morris introduced the song, "Another World (You Take Me Away To)," was written by John Leffler and Ralph Shuckett, where they appeared as themselves to perform at Felicia's restaurant TOPS. The Fifth Theme Song was an instrumental version of, "Another World (You Take Me Away To)." From March 30 - October 23, 1987 the song (sometimes including the lyrics) played during the Block Letters opening sequence. The original song, as sung by Crystal Gayle and Gary Morris, debuted as the opening theme on October 26, 1987 and was played until March 1, 1996 during the Computer Enhanced opening sequence. The Sixth and Final Theme was a slightly jazzy, fast-paced, industrial tune used with the MTV Style opening sequence. The song was written by Dominic Messinger. Dennis and Marley: "Only in My Dreams"
The original theme from 1964-1974 is available on "Original Themes From the Great Soap Operas" (Columbia House/Realm Records, 1977). This record is out of print, but copies may exist at flea markets and such. "Television Theme Recordings" by Steve Gelfand (Popular Culture Ink., 1984) has the 1981-1987 opening. The Gayle/Morris theme song is available on Crystal Gayle's "What if We Fall in Love?" (1987) and "Crystal Gayle: Duets" (2000), and on Gary Morris's "Gary Morris Greatest Hits Vol. II" (1990). The chorus used for the opening segment was available for download from Sound America, under "Themes." The songwriter version of the theme song, along with "Ladykiller," Jamie and Marley's theme, and Jamie and Kelsey's theme, are available on "Soap Opera's Greatest Love Themes Vol. II" (1992). Grant and Vicky's theme and Jake and Paulina's theme are available on "Soap Opera's Greatest Love Themes Vol. III." Ryan and Vicky's theme is available on "Soap Opera's Favorite Wedding Music" (1995). James Dunne wrote, produced, or published many of the songs used on Another World. Rick Rhodes also composed music for the show. From May 4, 1964 - March 26, 1987, partial, longer, or full versions of the opening theme songs were played during the end credits, except during special occasions. From March 27, 1987- March 1, 1996, there were three choices for end credit music. (1) The instrumental version of the new opening theme, "Another World (You Take Me Away To)" from March 30, 1987 - July 25, 1988. Occasionally the lyrical version would be used. (2) The "Rock" Instrumental, which started on July 26, 1988, was played about 90%-95% of the time. (3) Special music is played to commemorate special events during regular and special episodes. For about two years from 1987-1989, an instrumental version of the theme song was played occasionally. From March 4, 1996 - June 25, 1999, a new jazzy end theme was played during the end credits on a recurring basis. Danny Fargo. Danny wrote songs for his girlfriends. One of them, "Under The Moon With You," hit the airwaves and was performed by Marcella Martin (as girlfriend Flo Murray). It was a musical collaboration between Agnes Nixon and organist Clarke Morgan (once a musical director). Other songs written by Danny Fargo included: "In All the World," and a slow, dreamy song called, "My Love For You." Dawn Rollo. Dawn performed at TOPS. Dean Frame. Dean was a professional singer who went on to do concerts and make albums and music videos. Dean's songs included: Oh, Jenna; Ladykiller; Nothing Can Stand in the Way of Love; Only with You; All the Love I've Got (Tommy Kent, co-writer); A New Light Shines; The Man of My Dream. Kathleen McKinnon. Kathleen sang at the 1991 July 4th picnic and also appeared at a nightclub. Leo Mars. Leo was a professional singer who sang at his nightclub, The Warehouse. Lily Mason. Lily sang at Tallboy's restaurant. Maggie Cory. Maggie was sort of Dean's protégé. She went on to make a song with him as well as singing on the opening night of the Harbor Club. M.J. McKinnon. M.J. was an aspiring singer during her youth. Melissa Needham. She sang at, as well as managed, the Connection. Nicole Love. During her second incarnation she acquired a voice. Nicole performed at TOPS. Ronnie Lawrence. Ronnie used to don a wig and masquerade as Tiffany Simone, who sang at the Pelican Club. Sam Fowler. While testing a microphone during the set-up to one of Dean's concerts, Sam stunned everyone with his voice. He went on to become a successful country singer. Tracy DeWitt. Tracy was an enormously successful singer who toured and cut albums. Donna. Donna initiated an a cappella version of "Amazing Grace" during Sharlene's memorial service. In December of 1995 she sang love songs to Matthew in hopes of winning him back. Grant. Grant sang in KBAY's Match Dare telethon. Joe. Joe often performs Elvis tunes. Kelsey. Kelsey sang Gregory to sleep once. Marshall. Marshall sang at KBAY's Match Dare telethon. Michael. Michael took Donna on a vacation to Hawaii in 1986 and crooned to her while she swooned on the balcony. Morgan. Morgan hopped onto the piano at the Harbor Club and sang a song for Lorna. Toni. Toni sings in her church choir. Dean's backup band, Rascal were portrayed by: Sean Anthony, Lisa Bekker, Chris Howell, and Jeff Warren. During intermission (around the show's half-way mark) and show bumpers (between commercials) music was briefly played while the Opening Logo was shown. The music played was primarily the introduction of the opening theme songs, variations of the themes, or completely different melodies. From January 1975-September 4, 1981 a brief melody on string instruments was played. Other times, a piano struck nine notes with chords played on strings. From 1987-1996, the end of the theme song's chorus with Gary Morris and Crystal Gayle singing, "'Cause when I'm with you. You take me away to Another World" was used. From 1996-1999, the last few bars of the opening theme song was played. Over the years, many popular songs were played during scenes. In some cases, this was an effort to attract younger viewers. In the mid-1980's popular songs were frequently played during scenes as opposed to other years. One in particular, "Burning Down the House," by The Talking Heads was played in scenes that featured or involved Reginald Love (John Considine, 1986-1988). Several Billy Ocean songs during the summer of 1986. Recurring Themes: From the 1970s until 1987, certain scenes had specific musical accompaniments depending on the content. These included when something mysterious or sinister was happening on screen. A hypnotic arrangement was played while a character was having flashbacks. On September 28, 1979, Pink Floyd taped their song "One of My Turns," from their 1979 album, "The Wall." At the song's beginning, Trudy Young performs a monologue while a television plays in the background in the studio. Part of the television broadcast that was captured was an episode of that day's episode of Another World. The scene is possibly with Charles Cioffi who played Kirk Laverty (1979), but the other man is unknown at this time. Some dialogue is audible; most noteably, "Mrs. Bancroft," who was Iris while she was married to Brian Bancroft.